If your baby is always putting its hand in the mouth or trying to keep something in its mouth to chew, then that means it’s a teething time for your baby. Teething normally starts at the age of four to six months, during that period you should be very careful as the baby can literally put anything in their mouth to get some relief as they feel irritation in the mouth. Babies try to put their figures or anything that they reach to, will be in their mouth so to avoid such mistakes you need to buy the best teething mittens. Most people buy teether toys for their babies to put it in their tiny mouth, but some of these teethers toy are not safe to use. Also, some teethers even have dangerous and harmful chemicals that you don’t want your baby to put it in his/her mouth. That is why currently many parents are preferring teether mittens for their babies. Here you can find the 3 best teething mittens for babies that can help you find the best suitable teething mitten for your baby. The Much Mitt is the best Teething Mitten Teether that is designed to fit perfectly on your baby’s hand and does not come off easily. These teething mittens are designed for babies for self-soothing pain relief. This mom-invented ‘handy’ teething solution is made for the babies who are between three and seven months of age. The Munch Mitt Teething Mitten protect baby’s hands from continuous saliva on the skin and chewing. The handy Much Mitt Teether is the best solution to prevent the falling of the teething continuously. It offers an easy method for pain relief during teething period as the baby still learning to handle the direction and it protects the hands from constant chewing. The Munch Mitt is a safe and high-quality product made of phthalate and SiliconeBPA free, soft, and alkaline silicone, water-resistant fabric, and breathable. These teething mittens are tested by Intertek to make sure that it meets FDA requirements like CPSC (Consumer Safety Standards), the ASTM (American Society for Testing and Materials), and CPSC (Consumer safety improvement law). 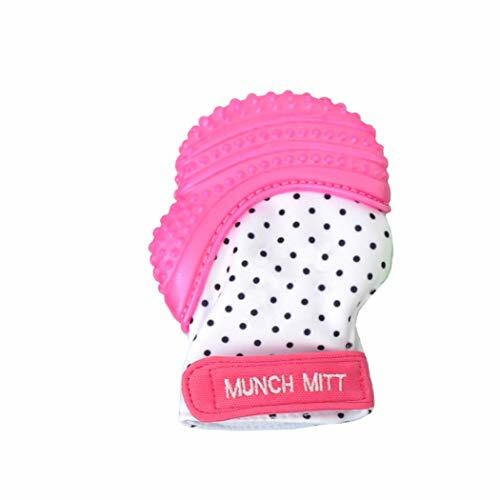 Munch Mitt Teething Mittens are available in different colors including, green, blue, pink, yellow, and more. The mitten protects baby’s hand offers soothing and relief from pain from chewing and saliva. Phthalate and Silicone BPA free and machine washable. Protects the baby’s hand from constant chewing and extreme saliva. The Munch Mitt Teether mitten can be worn on either left or right hand. 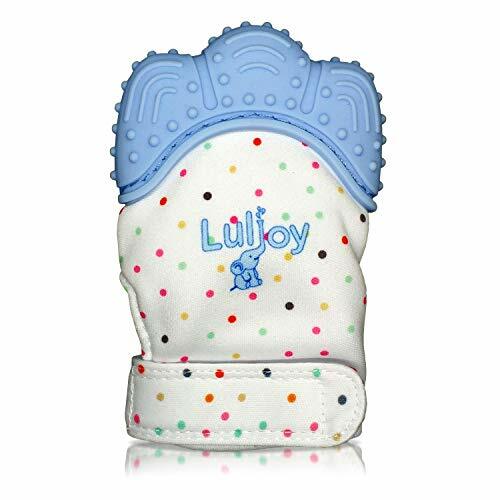 LuliJoy Teething Mitten is the best baby glove teether toys for girls and boys. It comes with an adjustable strap and stays on baby’s hand firmly. It is a soothing and stimulating mitten that soothes the baby’s tender gums at the time of teething. The teething mitt contains mouth-massaging composed bumps that give teething relief for your baby. Also, the babies can use the mitt as a toy if they are not teething. The mitten comes with crinkling fabric that causes a stimulating sound. The Lulijoy baby teething mitten set meets all the FDA safety standards, and it is approved by the FDA. The teether mittens are made of BPA-free, food-grade silicone, non-toxic teething, and assure high-quality and safe for baby to put it in the mouth. Lulijoy is designed to help you obtain baby tooth pain relief without any sensitive arrangements. Now, fuss-free teething is possible with this safe Lulijoy. As a parent, you all know that teething does not just causes uneasiness, but also drooling, dripping and can cause scratches to your baby’s cheeks while trying to put the teether in their tiny mouth. The cute Panda Teether is an innovative teething mitten that is made of silicone BPA-free that gives soothing feeling when baby chews the mitten. Also, it comes with the adjustable Velcro strap so that the baby doesn’t need to grab it as it stays firmly on the baby’s hand. The teething mitten meets all FDA safety rules and it is approved by the FDA for its Phthalate and BPA-free food grade silicone. The mitten teether toy is durable and soft, and it is made of the best material for a baby teether. The teether mitten makes crackle sound when play it to attract the attention of your baby, and the sound stimulating is verified as a helpful toy as it helps in the early stage of development in babies. 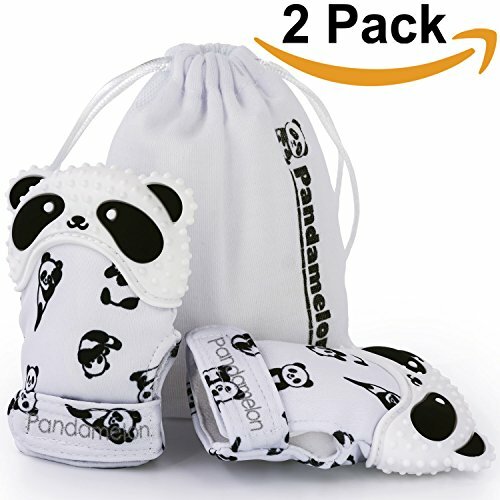 The cute panda mitten comes in black and white color that can easily attract baby’s interest, also, these bright contrasting colors will help your baby’s brain development. These innovative teething mittens can make a perfect gift as it includes teether toy and perfectly fit baby mittens. The best and innovative teething mittens that come with BPA-Free silicone teether. Safe for Baby as it is approved by the FDA. Multi-function Teething toy that makes crinkle sound that grabs the baby’s attention. Cute white and black Panda shape mittens and the colors favor in the baby’s brain development. Perfect Gift that comes with a carry bag to carry easily wherever you take your baby. These are the three best teethers that you can choose to buy for your baby teething needs. Babies’ love these handy mitten toys as they do not come out easily and also gives relives the baby from teething irritation and pain. Give yourself and your little baby alleviate of self-managing and teething help. These teether mittens are recommended for ages three to eight months babies. © 2018 - 2019 babyjumperguide.com All rights reserved. babyjumperguide.com is a participant in the Amazon Services LLC Associates Program, an affiliate advertising program designed to provide a means for website owners to earn advertising fees by advertising and linking to amazon.com, and any other website that may be affiliated with Amazon Service LLC Associates Program.